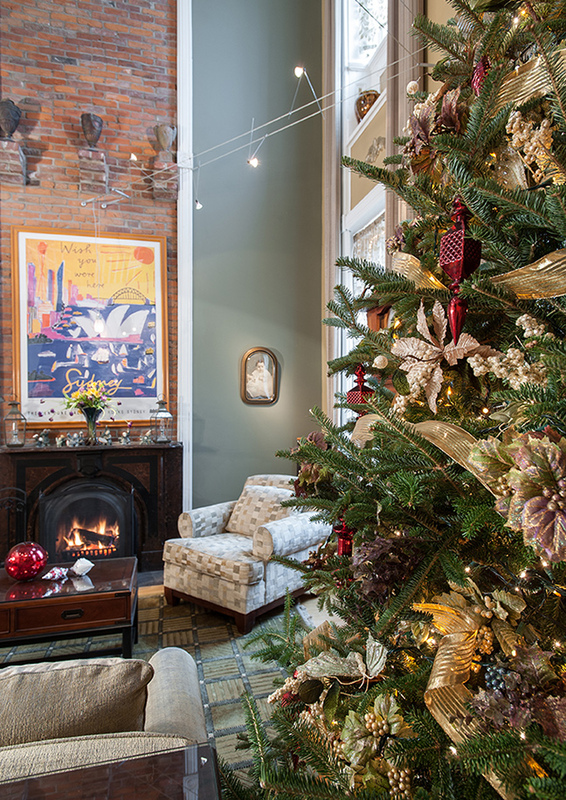 SImple holiday decor lets a historic Soulard home shine. Favoring traditional decor on the main floor, the coupletrims their real trea with classic red and silver ornaments. Exquisetly set for two, the dining table is left elegant and simple. 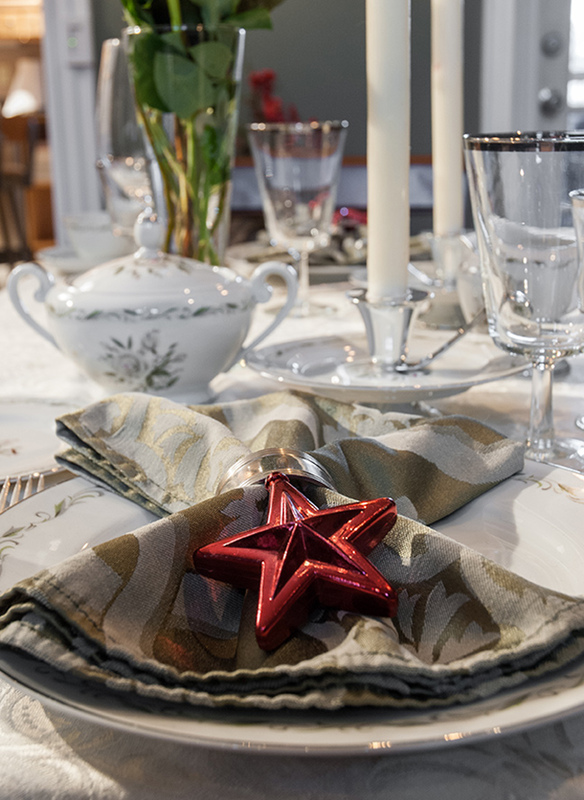 A red star ornament tied into the napkin on one of two place settings adds a subtle touch of festive spirit to the dining table. Inspired by luxury hotel suites, the master bedroom incorporates soft touches of gray, plush fabrics and prints of iconic architectural buildings. 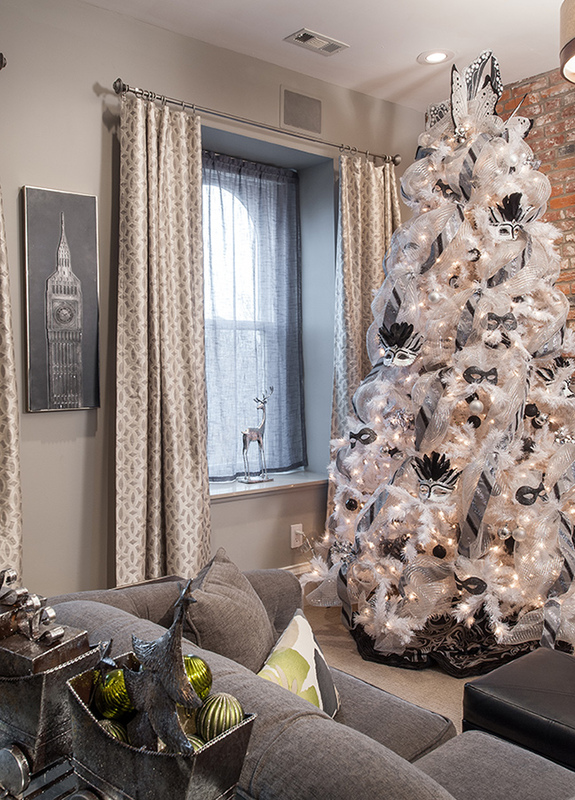 With a nod to Soulard, the master-bedroom tree is trimmed in black-and-white decor with feathers, ribbon and Mardi Gras masks. The underground grotto was used to store ice. Neal and John use the space for entertaining. Neal Thompson and John Wallace love to entertain during the holidays. Each year, the couple hosts a party for more than 100 family and friends. 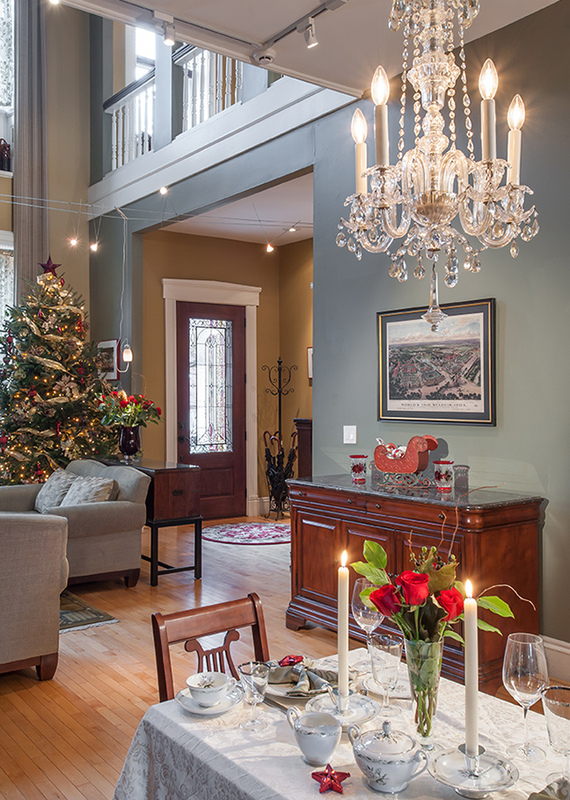 Taking in the festive décor that cheerfully fills their three-story Soulard home, first-time guests would never guess that Neal and John tore the place down to the studs and have spent more than 24 years renovating the home from the ground up. Built around 1870 by St. Louis architect Nathan D. Allen for stone-quarry owner Henry Brunelle, the home was originally three lots with the home built on an upper corner. The property served as a boarding house from 1910 until the late 1960s when it was damaged by a fire. It was purchased in 1978 for $1,500. A good price considering Henry Brunelle paid $4,000 for it to be built! With the goal of retaining the character of the original home but bringing it up to modern living, Neal and John transformed the home from its previous 1970s Spanish motif to a comfortable, contemporary mix of old and new, a theme in which they carry over into their holiday décor. Unique to the area, the grand entrance boasts an expansive 24-foot ceiling. While the couple loved the natural light the extra height brought in, the windows were awkwardly broken into four separate panels. To draw the eye up and play up the height, Neal made two floor-to-ceiling curtains to make the wall appear to be two long windows. The same effect is achieved with the fireplace where brick extends to the ceiling and is framed by white molding to set it off. Holiday décor in the main living space is kept simple yet elegant. A real tree is trimmed with traditional décor such as shimmering gold ribbon, faux floral leaves and classic red and silver ornaments. On the coffee table, an ornament arrangement plays off the tree. “On the main floor, we like more traditional holiday décor,” Neal explains. Included in the main living area, the dining room continues the subtle approach to the seasonal décor. 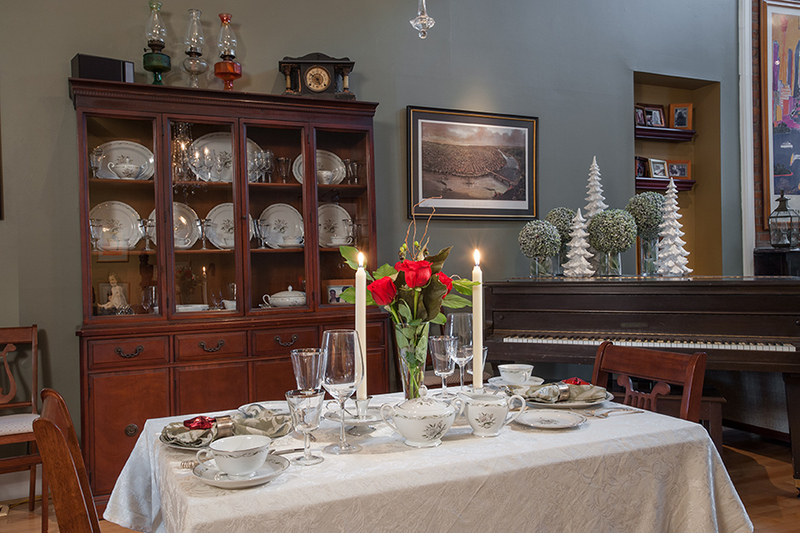 The table is exquisitely set for two with fine china topped with a single red star, which is a nod to the Soulard star found on the exterior of all the buildings in the area. On the piano, botanical balls set in clear glass vases are positioned next to shimmering trees. The display brings a modern approach to the otherwise traditional décor, which is a prime example of how the homeowners mix old with new. A fun contrast to the traditional décor on the first floor, the second-level loft, which overlooks the main-floor living room, is modern and playful. A white tree is swagged in sparkling blue ribbon and dotted with blue, silver and white ornaments. The colorful tree brings a whimsical feeling to the space. Neal and John transformed the third floor into their own private, master retreat. With no running water and horse hair-and-lath plaster walls, the space was quite the challenge. Previously three rooms, the couple turned the space into a master bedroom, walk-in closet and bath. Using experience in the travel industry, the inspiration behind the design of the master suite is modeled after a luxury hotel suite. 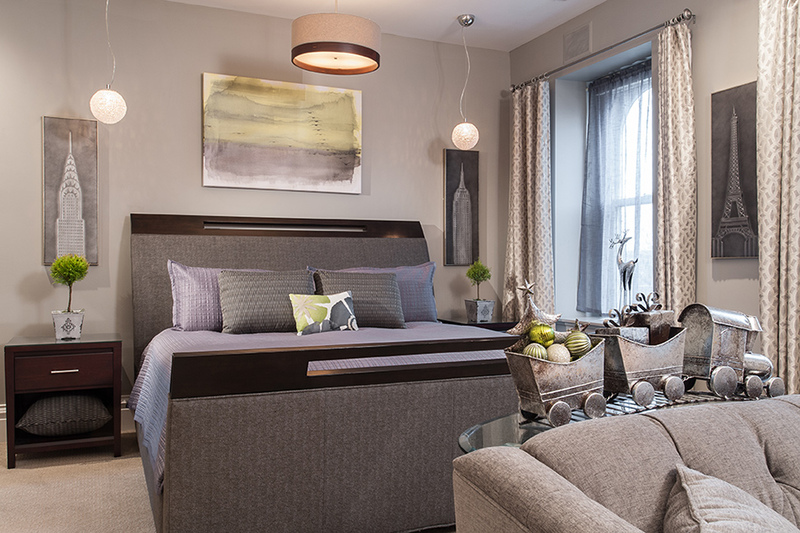 Soft-gray tones, plush fabrics and prints of iconic architectural buildings combine for a contemporary calm space. Understated holiday decorations add just the right amount of jolly to the master suite. A metal train set filled with silver and green ornaments chugs across a console table, while in the sitting area a white tree decked in feathers, masks and glitz and glam pays homage to the holiday Soulard is best known for… Mardi Gras. 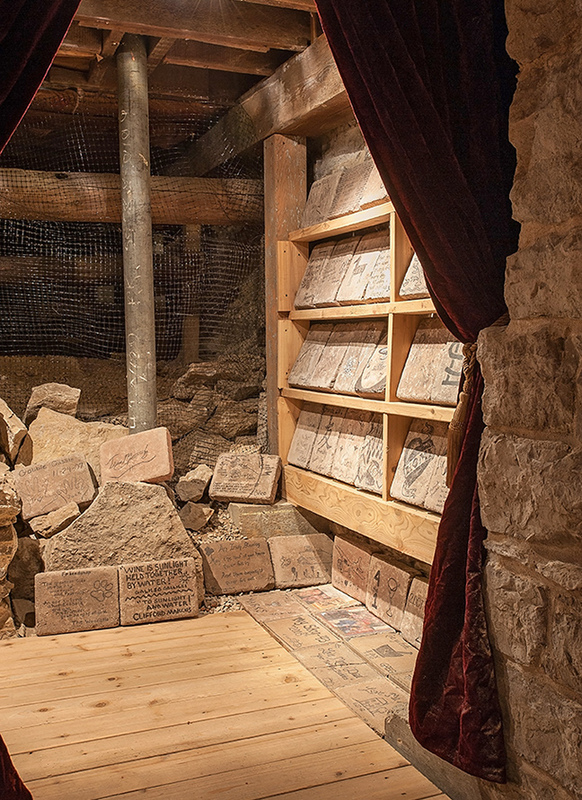 Used in the 1900s to store ice, today the grotto serves as a bonus entertainment space that is always a conversation starter. The intimate gathering place is a quaint spot for small dinner or cocktail parties. 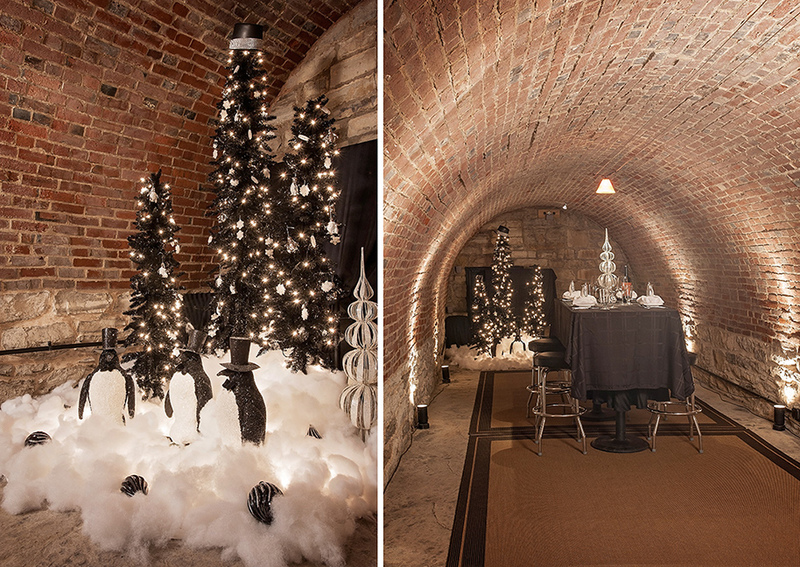 The architectural interest of the curved brick ceiling provides enough interest that holiday décor in the space didn’t need to be over the top. In the back left corner, a snowy setting with friendly-lighted penguins and trees represents the ice that used to be stored in the space. While Neal and John take ownership of most of the renovation and design decisions, they called in reinforcements to help take their holiday décor to the next level. Four of John’s aunts and one of his cousins came down over three separate weekends to plan and execute their vision. And what a spectacular job they did. Last year the couple's home was featured on the Soulard Parlour Tour, which Neal and John serve on the committee.